Roy Wilkins, “Roy Wilkins,” Histories of the National Mall, accessed April 23, 2019, http://mallhistory.org/items/show/145. 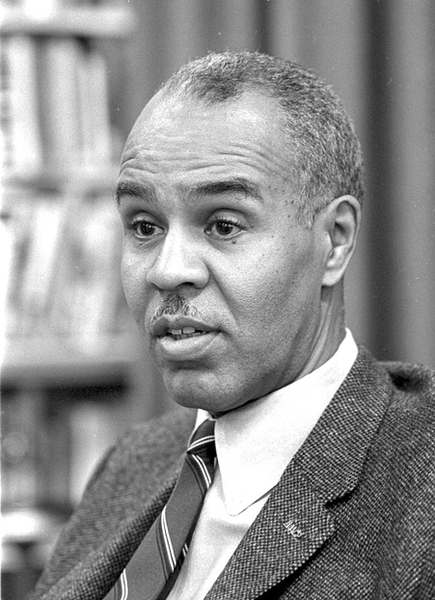 Roy Wilkins was a prominent civil rights activist who held leadership positions within the National Association for the Advancement of Colored People from 1931 until 1977. In 1941, he helped coordinate staff and financial support from the NAACP for A. Philip Randolph's proposed march on Washington to protest discrimination and segregation in the government. Although the march did not happen, it did result in an executive order banning discrimination in the national defense industry. In 1963, Wilkins was one of the leaders of the March on Washington for Jobs and Freedom, and in his speech, he emphasized the need for Congressional action on school desegregation. Roy Wilkins was born in 1901 in St. Louis, Missouri. His parents had moved to the city the year before from Mississippi, fleeing threats of racial violence against his father, a minister. Wilkins's mother died when he was young, and he and his younger sister went to live with their aunt and uncle in St. Paul, Minnesota. He graduated from the University of Minnesota in 1923 with a bachelors degree in sociology. In 1922, Wilkins had become the editor of a local black newspaper. After graduating, Wilkins moved to the Kansas City area to work as the editor of the Call, a weekly paper that served the African American communities of Kansas City, Missouri, and Kansas City, Kansas. In 1931, Wilkins became the assistant secretary of the National Association for the Advancement of Colored People, serving with Executive Secretary, Walter White. It was this position which led to his participation in the planning of the 1941 march on Washington organized by A. Philip Randolph, which was cancelled after President Franklin D. Roosevelt issued an executive order banning discrimination in the national defense industry. When Walter White died in 1955, Wilkins was unanimously named Executive Secretary of the NAACP by the Board of Directors. The landmark Supreme Court decision banning school segregation, Brown v. Board of Education, was issued the year before, and during his tenure as Executive Secretary, Wilkins had to grapple with the competing strategies of the growing number of civil rights organizations. In 1963, Wilkins was one of the leaders of the March on Washington for Jobs and Freedom. At the event, his speech addressed the continuing existence of segregation in schools and called on Congress to take decisive action. Wilkins retired in 1977 and lived the rest of his life in New York, NY.